A practical way of refurbishing a concrete patio or driveway is to lay concrete pavers over the surface. In addition, instead of using a sand or thinset mortar base, use construction adhesive designed for masonry to secure the pavers; this will prevent movement as well as the common problem of the odd paver popping up at a later stage. Measure the gap between the bottom of all exit doors and the existing concrete patio or driveway. Plan to leave at least a 3/4-inch gap between the bottom of the door and the finished paver surface, using thin pavers if necessary. Scrub the concrete surface clean using a concrete cleaner and a stiff-bristle broom or brush. Thoroughly rinse the area to remove all traces of detergent. Let the surface dry completely. Put on a pair of heavy gloves before starting work. Load a tube of masonry construction adhesive into a caulking gun. Use a utility knife to remove about a 1/2 inch from the tip by cutting through the end of the nozzle at a slight angle. Anchor the edge pavers first as follows: Lay two 3/16-inch beads of adhesive lengthwise along the edge of the concrete, about 2 inches in from the sides of your edge blocks. Use enough adhesive to cover about 48 inches at a time while working your way around the perimeter. Position the first block so its outer edge is flush with the edge of the underlying slab. Place a torpedo level on the block and check it for level, both end to end and side to side, while gently tamping the block into place with a rubber mallet. Alternatively, when working on a sloping driveway or walkway, ensure that the pavers are parallel to the concrete base. Weight down each block with a second paver as you lay it; this will prevent movement as the construction adhesive expands during the first few minutes of the curing process. Remove the weights after about 15 minutes. Continue laying perimeter blocks while carefully aligning the edge of each successive block and checking for level as you work. Place a 2-foot or 4-foot level across the set pavers periodically to make sure they are level with one another to ensure a flat finished surface. Allow 24 hours for the edge blocks to set before walking on the surface or laying the interior section of pavers. Complete the project by installing the interior pavers using the same procedure described in the previous steps. To create a simple running bond pattern, start the first interior course a half-block's distance from the sides of the edge blocks. Start the second course with a full block, and repeat the alternating pattern with each course. Once the interior section is installed, complete the project by filling the half-block gaps with cut pavers. Allow 24 hours setting time before using the patio or driveway. Wipe off any excess adhesive from the surface immediately with a damp rag. For added strength, use either interlocking pavers or lay oblong bricks in a herringbone pattern. 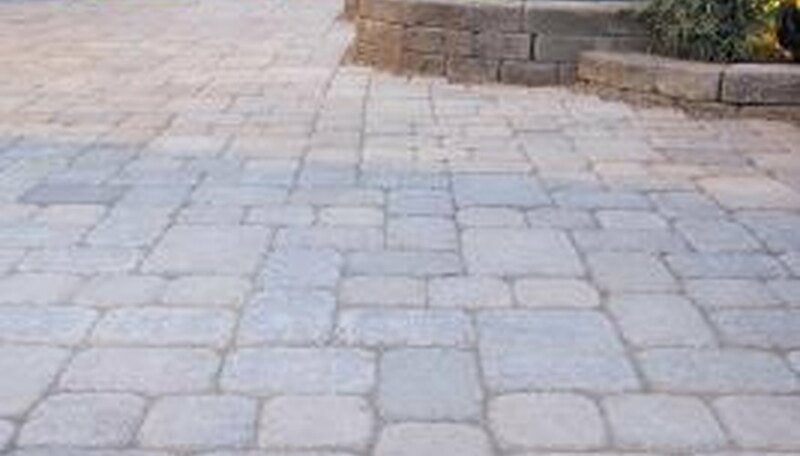 Although this method will prevent paver movement and render the installation virtually maintenance-free, you can save time and money by laying the interior pavers over a bed of washed sand. You must use sturdy interior pavers to prevent cracking, however, and edge pavers need to be at least 3/4 thicker than the interior blocks to allow for the depth of the added sand. Therefore, careful threshold planning is called for when using this method.